Staining floors requires additional steps and time above that required to finish a floor with just a natural finish. The staining process involves sanding an additional time, hand scraping and hand sanding along each wall to eliminate machine marks. Picking a stain starts with selecting color samples. You need to pick several colors from the sample to be applied to your sanded floor, because it is easier to pick a color from the sanded floor than the sample. The stain will then take 24 hours to dry. The goal of staining a floor is to have an even color throughout the room. 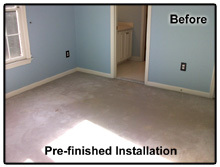 Generally, there are two types of finishes used on wood floors, oil base and water base. Oil base polyurethane is our preferred finish because of the way it penetrates the floor and gives the floor a deep, rich, and durable finish. 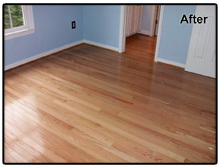 Floors by Dodd normally uses three coats of polyurethane (although two coats is a less expensive option). Polyurethane usually takes twenty four hours to dry, and ten to twenty days to fully cure. Water base finishes vary in color and consistency, as well as protection and durability. The manufacturers usually recommend three coats. Water base finishes usually takes two to four hours to dry, and five to seven days to cure.